The raids were such a problem coastal settlements were seldom undertaken until the 19th century. Between 1580 and 1680 corsairs were said to have captured about 850,000 people as slaves and from 1530 to 1780 as many as 1,250,000 people were enslaved. However, these numbers have been questioned by the historian Peter Earle. Some of these corsairs were European outcasts and converts (renegade) such as John Ward and Zymen Danseker. 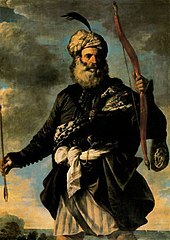 Hayreddin Barbarossa and Oruç Reis, Turkish Barbarossa Brothers, who took control of Algiers on behalf of the Ottomans in the early 16th century, were also notorious corsairs. The European pirates brought advanced sailing and shipbuilding techniques to the Barbary Coast around 1600, which enabled the corsairs to extend their activities into the Atlantic Ocean. [ unreliable source?] The effects of the Barbary raids peaked in the early to mid-17th century. The scope of corsair activity began to diminish in the latter part of the 17th century,  as the more powerful European navies started to compel the Barbary States to make peace and cease attacking their shipping. However, the ships and coasts of Christian states without such effective protection continued to suffer until the early 19th century. 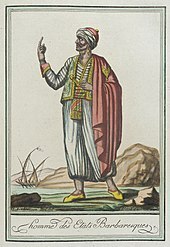 Following the Napoleonic Wars and the Congress of Vienna in 1814–15, European powers agreed upon the need to suppress the Barbary corsairs entirely and the threat was largely subdued. Occasional incidents occurred, including two Barbary wars between the United States and the Barbary States, until finally terminated by the French conquest of Algiers in 1830. During the American Revolution the pirates attacked American merchant vessels in the Mediterranean. But, on December 20, 1777, Sultan Mohammed III of Morocco issued a declaration recognizing America as an independent country, and that American merchant ships could enjoy safe passage into the Mediterranean and along the coast. The relations were formalized with the Moroccan-American Treaty of Friendship signed in 1786, which stands as the U.S.'s oldest non-broken friendship treaty   with a foreign power. As late as 1798, an islet near Sardinia was attacked by the Tunisians, and more than 900 inhabitants were taken away as slaves. Throughout history, geography was on the pirates' side on the Northern coast of Africa. The coast was ideal for their wants and needs. With natural harbours often backed by lagoons, it provided a haven for guerrilla warfare, such as attacks on shipping vessels venturing through their territory. On the coast, mountainous areas provided ample reconnaissance for the corsairs as well. Ships were spotted from afar; the pirates had time to prepare their attacks and surprise the ships. In 1544 Hayreddin captured the island of Ischia, taking 4,000 prisoners, and enslaved some 2,000–7,000 inhabitants of Lipari. In 1551 Turgut Reis enslaved the entire population of the Maltese island of Gozo, between 5,000 and 6,000, sending them to Ottoman Tripolitania. In 1554 corsairs under Turgut Reis sacked Vieste, beheaded 5,000 of its inhabitants, and abducted another 6,000. 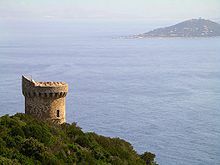 In 1555 Turgut Reis sacked Bastia, Corsica, taking 6,000 prisoners. In 1558, Barbary corsairs captured the town of Ciutadella (Minorca), destroyed it, murdered many inhabitants, and took 3,000 to Constantinople as slaves. In 1563 Turgut Reis landed on the shores of the province of Granada, Spain, and captured coastal settlements in the area, such as Almuñécar, along with 4,000 prisoners. Barbary corsairs often attacked the Balearic Islands, and in response many coastal watchtowers and fortified churches were erected. The threat was so severe that residents abandoned the island of Formentera. During the first half of the 17th century, Barbary raiding was at its peak. This was due largely to the contribution of Dutch corsairs, notably Zymen Danseker (Simon de Danser), who used the Barbary ports as bases for attacking Spanish shipping during the Dutch Revolt. They cooperated with local raiders and introduced them to the latest Dutch sailing rigs, enabling them to brave Atlantic waters. Some of these Dutch corsairs converted to Islam and settled permanently in North Africa. Two examples are Süleyman Reis, " De Veenboer", who became admiral of the Algerian corsair fleet in 1617, and his quartermaster Murat Reis, born Jan Janszoon. Both worked for the notorious Dutch corsair Zymen Danseker. 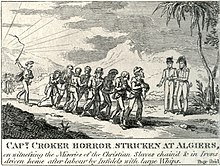 More than 20,000 captives were said to be imprisoned in Algiers alone. The rich were often able to secure release through ransom, but the poor were condemned to slavery. Their masters would on occasion allow them to secure freedom by professing Islam. A long list might be given of people of good social position, not only Italians or Spaniards, but German or English travelers in the south, who were captives for a time. While the chief victims were the inhabitants of the coasts of Sicily, Naples and Spain, all traders of nations which did not pay tribute for immunity or force the Barbary States to leave them alone were liable to be taken at sea. Religious orders – the Redemptorists and Lazarists – worked for the redemption of captives, and in many countries the wealthy left legacies to support such redemptions. England was the most successful of the Christian states in dealing with the corsair threat. [ citation needed] From the 1630s onwards England had signed peace treaties with the Barbary States on various occasions, but invariably breaches of these agreements led to renewed wars. A particular bone of contention was the tendency of foreign ships to pose as English to avoid attack. 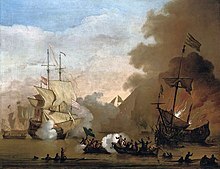 However, growing English naval power and increasingly persistent operations against the corsairs proved increasingly costly for the Barbary States. During the reign of Charles II a series of English expeditions won victories over raiding Barbary squadrons and mounted attacks on their home ports; these actions permanently ended the Barbary threat to English shipping. 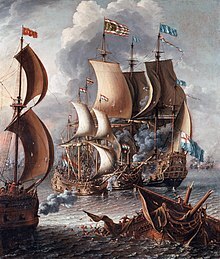 [ citation needed] In 1675 a Royal Navy squadron led by Sir John Narborough negotiated a lasting peace with Tunis and, after bombarding the city to induce compliance, with Tripoli. 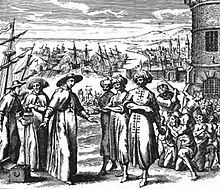 Peace with Salé followed in 1676. Until the American Declaration of Independence in 1776, British treaties with the North African states protected American ships from the Barbary corsairs. Morocco, which in 1777 was the first independent nation to publicly recognize the United States, in 1784 became the first Barbary power to seize an American vessel after the nation achieved independence[ citation needed]. The Barbary threat led directly to the United States founding the United States Navy in March 1794. While the United States did secure peace treaties with the Barbary states, it was obliged to pay tribute for protection from attack. The burden was substantial: in 1800 payments in ransom and tribute to the Barbary states amounted to 20% of United States federal government's annual expenditures. The United States conducted the First Barbary War in 1801 and the Second Barbary War in 1815 to gain more favorable peace terms; it ended the payment of tribute. But, Algiers broke the 1805 peace treaty after two years, and refused to implement the 1815 treaty until compelled to do so by Britain in 1816. Captives often suffered from privation on voyages to North Africa if taken at a distance. Those who survived the journeys were often forced to walk through town as they were taken to slave auctions. The slaves typically had to stand from eight in the morning until two in the afternoon while buyers viewed them. Next came the auction, where the townspeople would bid on the captives they wanted to purchase and once that was over, the governor of Algiers (the Dey) had the chance to purchase any slave he wanted for the price they were sold at the auction. During the auctions the slaves would be forced to run and jump around to show their strength and stamina. After purchase, the captives would either be held for ransom, or be put to work. Slaves were used for a wide variety of jobs, from hard manual labor to housework (the job assigned to most women slaves). At night the slaves were put into prisons called ' bagnios' (derived from the Italian word "bagno" for public bath, inspired by the Turks' use of Roman baths at Constantinople as prisons),  which were often hot and overcrowded. 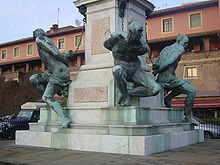 However, these bagnios began improving by the 18th century. Some bagnios had chapels, hospitals, shops, and bars run by captives, though such amenities remained uncommon. Although the conditions in bagnios were harsh, they were better than those endured by galley slaves. Most Barbary galleys were at sea for around eighty to a hundred days a year, but when the slaves assigned to them were on land, they were forced to do hard manual labor. There were exceptions: "galley slaves of the Ottoman Sultan in Constantinople would be permanently confined to their galleys, and often served extremely long terms, averaging around nineteen years in the late seventeenth-century and early eighteenth-century periods. These slaves rarely got off the galley but lived there for years." During this time, rowers were shackled and chained where they sat, and never allowed to leave. Sleeping (which was limited), eating, defecation and urination took place at the seat to which they were shackled. There were usually five or six rowers on each oar. Overseers would walk back and forth and whip slaves considered not to be working hard enough. Sayyida al-Hurra was a female Muslim cleric, merchant, governor of Tétouan, and later the wife of the sultan of Morocco. She was born around 1485 in the Emirate of Granada, but was forced to flee to Morocco when she was very young to escape the Reconquista. In Morocco, she gathered a crew largely of exiled Moors, and launched pirate expeditions against Spain and Portugal to avenge the Reconquista, protect Morocco from Christian pirates, and seek riches and glory. She co-founded the Barbary Corsairs with her allies the Barbarossa brothers, who divided the Mediterranean between them—the Barbarossas and their Ottoman fleet operating in the east, and Sayyida al-Hurra and her Moorish and North-African pirates operating in the west. 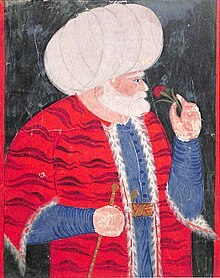 Sayyida al-Hurra became wealthy and renowned enough for the Sultan of Morocco, Ahmad al-Wattasi to make her his queen. Notably, however, she refused to marry in his capital of Fez, and would not get married but in Tétouan, of which she was governor. This was the first and only time in history that a Moroccan monarch had married away from his capital. ^ Chaney, Eric (2015-10-01). "Measuring the military decline of the Western Islamic World: Evidence from Barbary ransoms". Explorations in Economic History. 58: 107–124. doi: 10.1016/j.eeh.2015.03.002. ^ a b c d Chisholm, Hugh, ed. (1911). "Barbary Pirates" . Encyclopædia Britannica (11th ed.). Cambridge University Press.